VENERABLE POLITICAL NORMS have been upended during this crazy election season, but at least one presidential-campaign tradition remains intact. Every four years, candidates for the White House firmly pledge that, if elected, they will relocate the US embassy in Israel from Tel Aviv to Jerusalem. 2016 has been no exception. At the annual American Israel Public Affairs Committee gathering in Washington last week, Republican front-runner Donald Trump was cheered when he declared that as president he would "move the American embassy to the eternal capital of the Jewish people, Jerusalem." A few hours later, Texas Senator Ted Cruz not only made the same promise, but said the process would begin on his "very first day in office." Ohio Governor John Kasich, asked about the embassy issue on CNN, confirmed that he too wants the US embassy moved to Israel's capital. Jerusalem didn't come up in Hillary Clinton's AIPAC speech; then again, she had come out for moving the embassy long before anyone was even thinking of 2016. In 1999, while still first lady and planning a US Senate race, Clinton vowed to be an "active, committed advocate" for relocating the embassy from Tel Aviv. That was seven years after her husband, campaigning for president in New York, had affirmed his support for Jerusalem "as an undivided city, the eternal capital of Israel, and [for] moving our embassy to Jerusalem." George W. Bush in 2000, John Kerry in 2004, John McCain in 2008 — though the nominees change, the quadrennial promise to shift the American embassy in Israel to the country's capital has been as consistent as Old Faithful. But even more consistent is the failure of any president to keep that promise once in office. Candidates routinely give assurances that they have no intention of keeping. But moving the embassy in Israel to Jerusalem ought to be a no-brainer. The United States maintains nearly 190 embassies, one in virtually every country on earth. In every one the embassy is located in the capital of the host country. Israel is the lone exception. Washington has never formally recognized Jerusalem as Israel's capital. When asked what the country's capital is, administration spokesmen tie themselves in knots to avoid giving an answer. This isn't just an absurdity, it's an insult to an ally. It's also a continuing act of appeasement to rejectionists who oppose Jewish sovereignty over any part of the Jewish homeland. Such discriminatory treatment is obnoxious; that is why presidential hopefuls keep pledging to fix it, and why the House and Senate more than a decade ago, by overwhelming majorities, passed a law — the Jerusalem Embassy Act of 1995 — requiring that the embassy be moved. 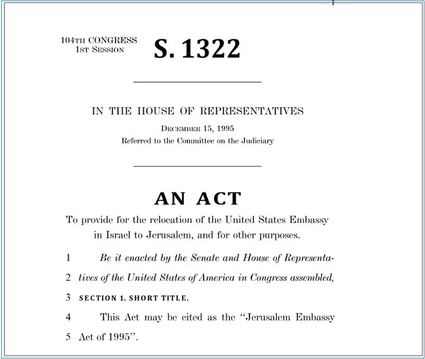 In 1995, by overwhelming majorities, Congress passed a law mandating the relocation of the US embassy in Israel to Jerusalem. But every president since then has invoked a national-security waiver allowing the move to be postponed. Yet nothing changes. A waiver provision in the 1995 law empowers the president to suspend the relocation for six months if necessary "to protect the national security interests of the United States." Every six months, with perfect regularity, each president since Bill Clinton has issued a waiver. When pressed, the White House or State Department says that relocating the embassy would amount to prejudging an issue that should be settled through negotiation. That might be plausible if the US embassy were to be established in eastern Jerusalem — which was occupied by Jordan from 1948 until Israel liberated it in the Six Day War. 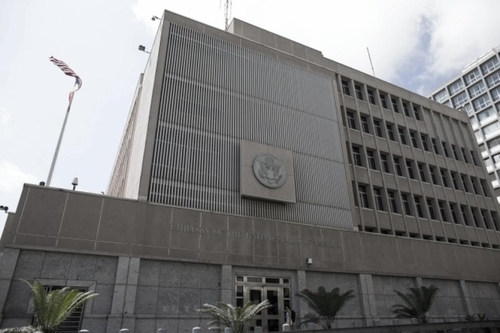 But no one has ever suggested that the embassy go anywhere but West Jerusalem, the undisputed seat of Israel's government since 1948. Israel's enemies don't object to siting foreign embassies in Jerusalem because it would undermine diplomatic negotiations. They object because they deny Israel's claim to any part of Jerusalem, even parts that have always been sovereign Israeli territory. They deny, in other words, that Israel's very existence is a settled issue. Moving the US embassy to Jerusalem would send one message, simple but significant: Americans do not regard the survival of the Jewish state as negotiable.